Carl was born in Steiman, Virginia, Kentucky, USA as Carl Linden Shell, to Carl D. Shell and Ida (Hughes) Shell. His father was a coal miner in the Eastern part of Kentucky, in and around Hazards. This was the reason that Carl went into the army on the age of 16 in October 1942, he'd rather go to war than have to work in the coal mines. 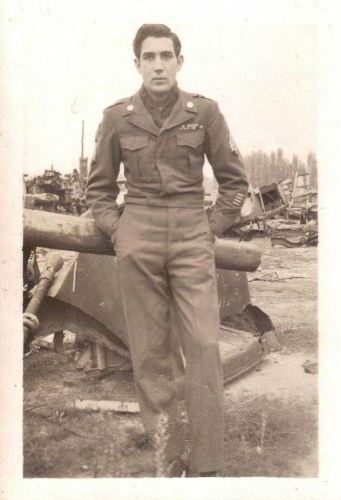 He volunteered October 31, 1942 with the papers of his father and was sent to Fort Riley, Kansas. There, the army was forming the 9th Armored Division and Carl became a Tank Gunner. As they were trained to fulfill every position inside a tank, Carl could drive, load and be a gunner when necessary. In 1943 he went to the desert for desert training in California. At first they had the M3 Tanks that only had a 60° traverse on the main gun, but later they received the M4. They came out of desert training not knowing where they would be send but after California, they went to Fort Polk, Louisiana in July, 1944 for swamp training. In case the destination would be the Pacific. August 26, 1944 he shipped out from New York and they landed at Hampton, England. They spent some time at Tidworth barracks maintaining and test firing the tanks before they were put on LST's to cross the channel. From Omaha Beach they made their way towards Germany and got into contact between Paris and Belgium. There it was regular combat until they arrived at St. Vith and Lignieuville where they were when the Battle of the Bulge began. Carl was on watch when the Germans reached their positions, he warned the rest of the men but some were asleep inside the tanks, so he jumped up the 50 cal and burned up a belt of ammo. From then on it was just survival, he had his worst day while covering the retreat of the entire Combat Command in the direction of Manhay on December 23, 1944. As German patrols attacked the tanks they tried to climb up the tank and drop a grenade down the hatch so they were told to close their hatches at all times and the gunner was told to elevate the gun as high as possible. In the chaos of the battle he got his only tank of the war: a Mark IV, he was pretty proud and glad the German didn't got him. After that he did score some more hits but he didn't really knocked out another tank. After the Battle of the Bulge they were brought to full strength again and they went on to cross the Rhine. He assisted in the crossing of the Rhine river at Remagen March 7, 1945. One time the Tank Commander got pretty mad at him, when they were driving through a German town they always had to be careful not to run into a Bazooka rocket because that would easily knock them out so one time he saw a Bazooka squad running across the road. He grabbed his submachine gun and crawled out of the tank in pursuit of the Germans. He discovered three 14 year olds with everything necessary to succesfully stop an American Tank. When he got back to the tank his commander yelled that he should never do that again. they had a 30 cal. coaxial with the 75mm, so if you pushed both buttons they would fire simultanously, he sometimes pushed the wrong button and accidentally threw a High Explosive towards a German soldier! At the end of the war they had reached Carlsbad, Czechoslovakia. Carl was on the ocean heading for the Pacific as a replacement when he got the news the war was over. When the war was over and he got home his parents didn't knew, so he just walked in and they almost suffered of a heart-attack seeing him again. He worked about thirty days in the mines of Virginia when he told his dad he rather fought wars than go back inside that mountain. So he went to Norton, Virginia and reenlisted. He volunteered for overseas duty but he had enough of tanks so he ended up in A Co of the 18th Infantry Regiment, 1st Infantry Division. The 18th also was part of the 8th Infantry Division for a while. 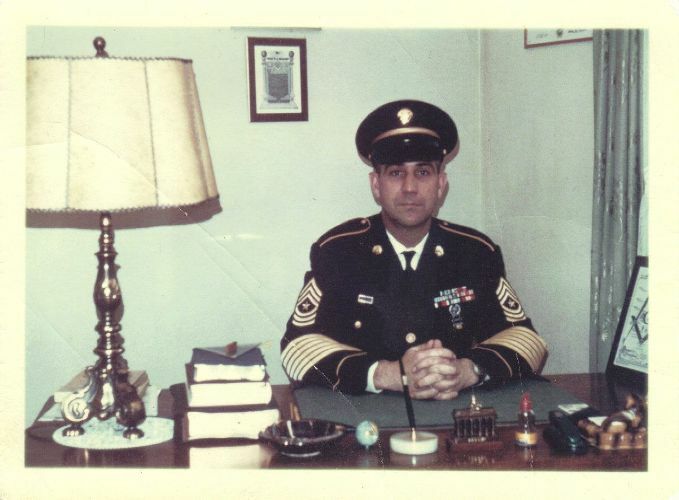 After he reached the highest possible rank for an enlisted man, E-9 or Command Sergeant Major, he retired in 1963. He spent 15 years in Germany on occupation duty and married a German girl, Katharina Woche on November 18, 1954. Katharina, passed away in 2001 and Carl remarried on April 26, 2008 to Laura L. Tholin with whom he lives in Junction City, Kansas and she survives. 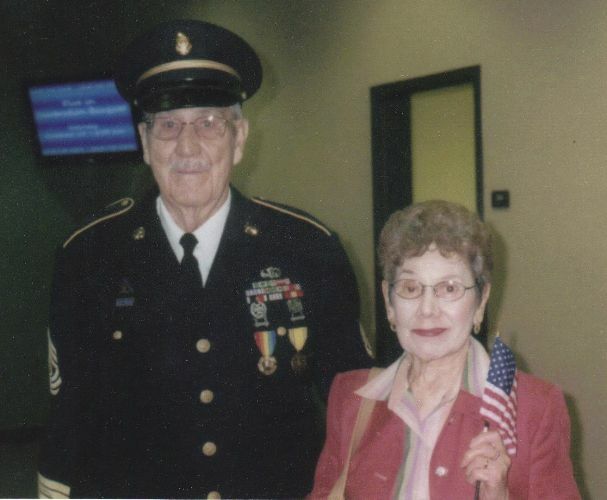 Carl died Saturday, January 17, 2015 at the Newton Presbyterian Manor, and is burried at the Kansas Veterans’ Cemetery at Fort Riley. 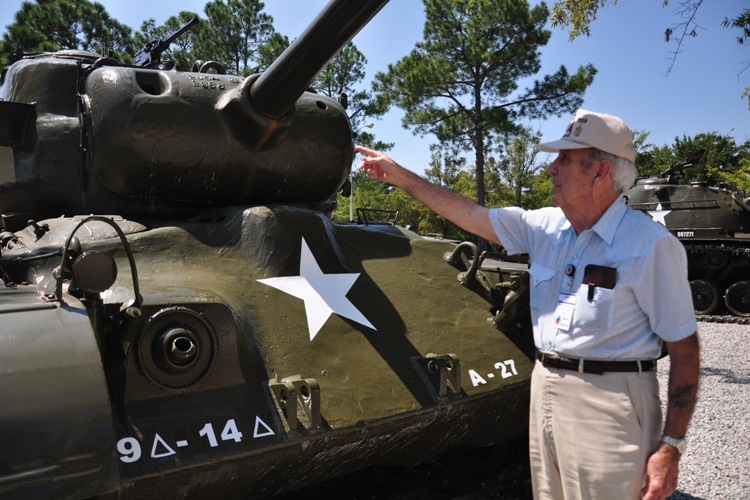 WWII veterans toured Fort Jackson as part of "The Veterans of the Battle of the Bulge" National Convention, held in Columbia. After the lunch in the 120th Adjutant General Battalion Dining Facility, Carl spotted a WWII-era Sherman Tank on display. Carl points a .30 caliber machine gun on top of the M-26 Pershing Tank. 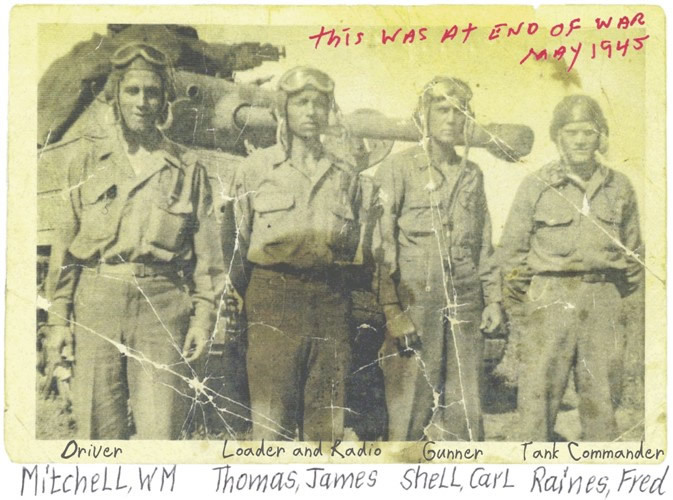 Carl Shell of Junction City, Kansas, is the 4th from the left. 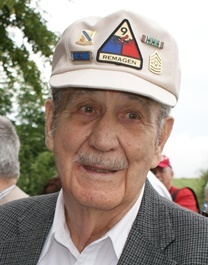 Six World War II Army veterans were honored on Friday, August 11th, at the White House Visitor Center in downtown Washington. The surviving veterans of the 14th Tank Battalion of the 9th Armored Division were greeted by NPS White House liaison Ann Bowman Smith and thanked for their service to their country, including their stand at Bastogne during the Battle of the Bulge, which allowed the 101st Airborne to dig in for a defence of the city, and their critical taking of the last remaining bridge across the Rhine River at Remagen, Germany. Elements of the battalion led the taking of the Ludendorff Bridge as the German army attempted to blow it up in March, 1945. The division then held the bridge for ten days, allowing men, tanks and equipment to pour across the Rhine as the Allies built pontoon bridges across the river. Although the Americans held the bridgehead, the Germans were still not ready to give up their efforts to destroy the bridge. Twenty-one fast bombers flew in to attack the structure, but they were unable to destroy it. German Navy divers attempted underwater attacks, but arrived too late to finish off the weakened structure. The taking of the Ludendorff Bridge was credited by military officials as accelerating the Allied push into Germany, thwarting the Nazis and advancing the end of the war in Europe. Officers from the U.S. Army Joint Force Headquarters, National Capital Region, of the Military District of Washington (MDW) presented the veterans with certificates of recognition, MDW challenge coins, and a letter from Major General Galen B. Jackman, the district’s commanding general. The veterans honored were C. Windsor Miller of Fairfield, Pennsylvania, Howard Best of Taylor Mill, Kentucky, Robert (Bob) Janos of East Lake, Ohio, Clemon Knapp of Rupert, West Virginia, Ira Mullins of Columbus, Ohio, and Carl Shell of Junction City, Kansas. Elements of the MDW Fife and Drum Corps performed for the 100 family members, friends and visitors in attendance. Ranger Mike Moreno presented an interpretive overview of the military and battle connections with the White House and President’s Park. 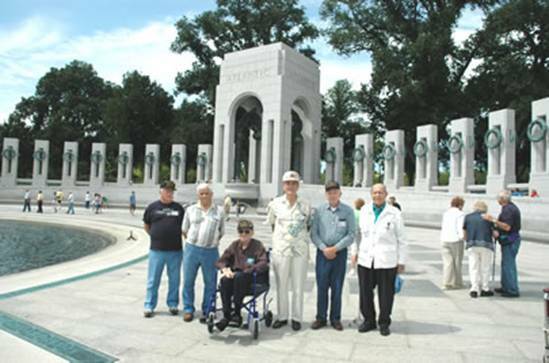 Following the ceremony, the veterans visited the World War II Memorial and heard an interpretive presentation by Ranger Brad Burger.